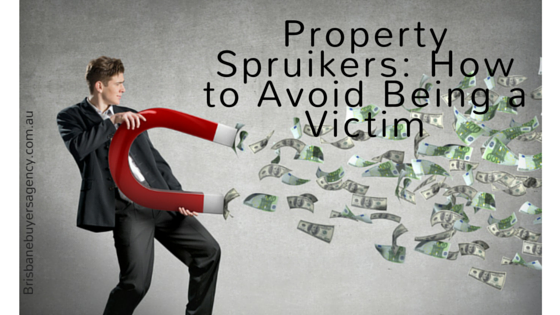 Avoid the trap of property investment seminars – they are not all they are cracked up to be.We’ve all heard stories about people getting caught in the hype of property investor workshops, where spruikers convince them to part with their hard-earned cash on a ‘sure thing’, only to end up losing a small – or not-so-small – fortune. These stories aren’t urban myths. Clients of mine, John and Theresa, purchased a townhouse on the Sunshine Coast after attending one of these seminars. They fell for the hard sell and promise of capital growth, guaranteed returns, and the benefit of the nearby university, which would drive demand … and they were burnt! After the initial purchase, they were continually asked to spend money on unexpected items such as upgrading furniture (a hidden requirement of the complex). Sinking fund forecasts were not prepared accurately so Body Corporate costs increased astronomically. John and Theresa were burnt! Not only did they not recover their costs after six years in the investment. They also had to cop the opportunity cost for not investing wisely. I estimate they lost, at least, $100,000 in the deal. This is not an isolated story. Some people have had their lives destroyed and their confidence shattered by the loss of such large sums of money. We read these stories in the media regularly and with an unregulated market, there’s currently no real recourse for victims of these property spruikers. If you’re inexperienced when it comes to buying property you’ll probably know it is possible to make money with property (after all, plenty of people are doing it) but you won’t know much more. This is where the spruikers strike. You might have received a glossy invitation to a seminar four or five-star hotel in the CBD, offering you a VIP opportunity to view an exclusive property investment opportunity. Once you arrive there may be wine, nibblies and a group of young, smartly dressed staff welcoming you to this very special event. Then you’ll be ushered to a comfortable seat and handed glossy brochures filled with an enormous amount of data and graphs highlighting why you should buy in a particular area. The brochure and discussion will set out how anticipated population growth, neighbouring infrastructure, and unique local amenities will lead to huge capital growth for new property in the area. You’ll hear about the benefits of buying a new property since the typical spruiker investment is either a house-and-land package or unit development. They will highlight a wide range of benefits including government incentives, tax advantages due to depreciation (you need to check that the depreciation benefits used in calculations are not over inflated as I have sometimes seen in the past), low maintenance costs, and your choice of fixtures and fittings. There is generally a lot of big picture talk on the economy and predicted growth rates which they apply to the subject investment they are selling. They also put this into the calculations to show your after tax spend. ACTION: Ask them to apply historical growth rates based on local data to the area and re-do calculations. ACTION: Check the tax depreciation benefits are appropriately estimated by a qualified Quantity Surveyor. Let’s not forget the clincher in the pitch – guaranteed rental returns! The rent on your property will be guaranteed for a certain period of time. This should immediately ring alarm bells. If it’s a sound investment there’s no need to guarantee the return. Please be wary of what will happen after the guaranteed period ends – what will the rental return? ACTION: research the current rental returns in the area and their historical increase over the past 5 years and again apply these to the calculations they provide. They’ll do everything for you! You won’t have to lift a finger, which is perfect in our time-poor world. If you invest with this group you’ll have an easy investment in your portfolio earning you untold wealth. When the salesperson talks about capital growth, which is the main reason for investing, do some probing to find out if their figures are accurate. In Queensland, there are many examples where new developments have sold for a premium price, only to sell years down the track for substantially less, or not much more, than the purchase price five years on. In the case of new house and land, new stock is coming on-line continually as there are many large tracts of land ripe for subdivision in south-east Queensland. One such location is Pimpama. In 2010 the median house price for a home in Pimpama was about $470,000. For Wavell Heights, an established inner city location, the median house price was not much more at $490,000. Five years on, the median house price for Pimpama is still the same, and Wavell Height is $630,000. That is a major capital gain difference of $120,000 – if you take into account the entry point price difference. In terms of rent, there is not much in it with median rentals at $420 for Pimpama versus $450 for Wavell Heights. Again an established suburb, in the inner city, wins out. The losses in Q1 have been enormous. Again aside from the dollar value (in the millions), there would have been interest and body corporate costs. So how can these losses happen? Many of the properties that spruikers selling are in areas where there are too many new properties being constructed (supply outstrips demand). Typically these areas also have a greater percentage of renters as opposed to owner-occupiers. These factors will restrict capital growth. Don’t be one of those people who lose everything you’ve worked for over the years on the promise of wealth. The best advice is to live by the old adage ‘if it sounds too good to be true, it probably is’. There is no magic or quick fix unless you are a developer constantly looking for the next deal to buy, sell and moves on. Look at the immigrants who came to Australia in the 50’s. All they knew was to work hard and invest in property. A lot of them are very wealthy people today because they had a long-term vision for their property portfolio rather than a quick fix. You can absolutely create wealth from property, but like anything, investing requires education, thorough research and hard work. If you don’t have the time to do it yourself, find someone reputable who can do it for you, such as a buyers’ agent. Even with our professional fee, you will still be better off. Buyers will too often focus on the illusion of no cost entry and not on the long-term gain. At the end of the day, you’ll be saving money by using a credible professional, who will act on your behalf and in your best interests. They’ll find you a good property in an area that has the right fundamentals for capital growth and they’ll negotiate hard to secure a property for a good price. This situation further reinforces the need for you to really check the claims made and “facts” or “data” provided by property spruikers. Please do not take what they say at face value. Never heard of a buyer’s agent? A buyer’s agent is someone who will do the research and hard work to find you a sound investment property that will meet your brief, negotiate on your behalf and help you build your property portfolio. A buyer’s agent acts as your advocate in the buying process and can manage the whole transaction on your behalf. At Brisbane Buyers’ Agency, we help our clients make smart property decisions as easily as possible. We are focused on the Brisbane market. We have a proven process and are highly experienced negotiators who regularly save our clients money, time and frustration using our proprietary property analytics tool, the Brisbane Buyers Agency Smart Buyers Index. We work on a flat fee arrangement, we do not work on commission, so you know exactly what your costs will be.